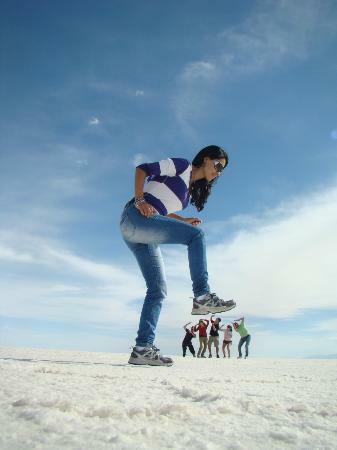 I just learned about the Salar de Uyuni: the world’s largest salt flat, located in southwest Bolivia. It’s about 10,000 square kilometers in area! It’s high up, near the crest of the Andes, 3,600 meters above sea level. Once there were permanent lakes here, but no more. This area is a transition zone: the eastern part gets rain in the summer, but clouds never make it past the western part, near the border with Chile. Further west comes the the famously dry Atacama Desert. 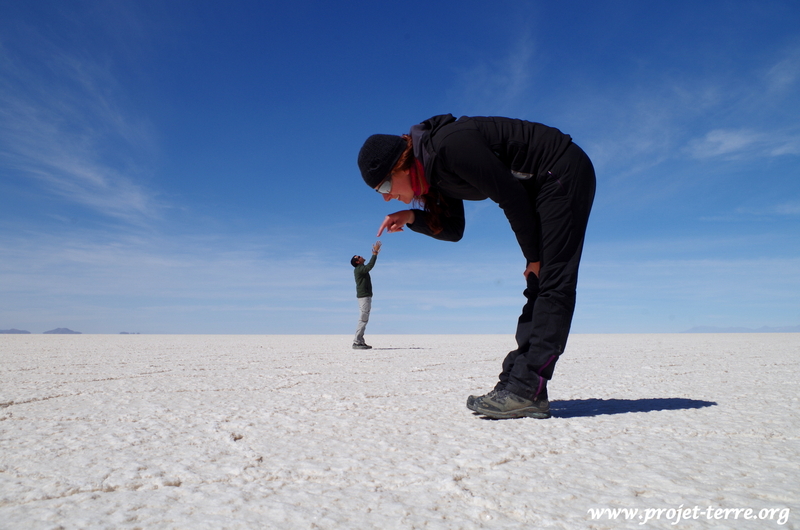 The Salar de Uyuni is high, but still it lives up to the name ‘salt flat’: its salt crust varies in height by less than one meter over the entire area. It’s so flat that people use it for testing equipment that measures altitudes. Why is it so flat? Because the dry crust covers a huge pool of brine that is still liquid! This brine is a saturated solution of sodium chloride, lithium chloride and magnesium chloride in water. 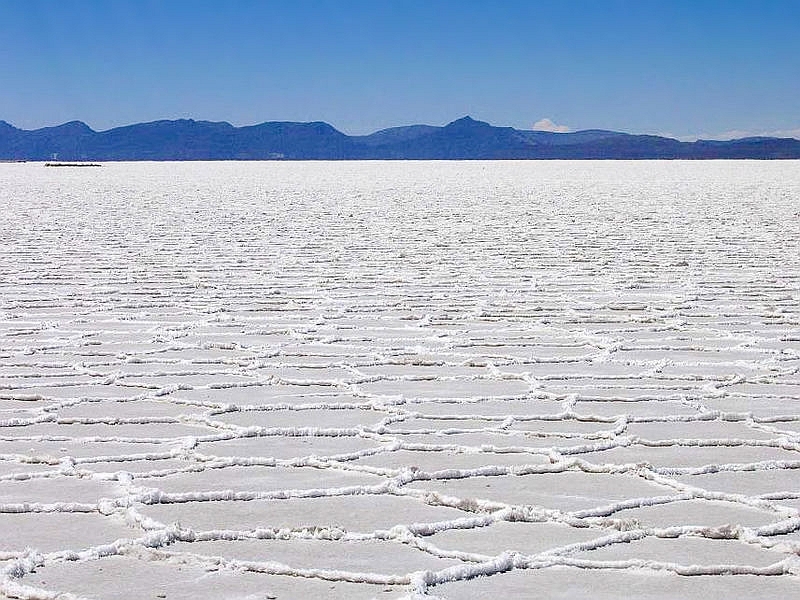 As a result, Salar de Uyuni contains over half of the world’s lithium reserves! And when it’s wet, three different types of flamingos visit the Salar: the Chilean flamingo, the rare Andean flamingo, and the closely related but even rarer James flamingo, which for a while was thought to be extinct! Flamingos eat algae that grow in the brine. This is why they’re pink! Newly hatched flamingos are gray or white. Their feathers become pink only thanks to carotene which they get from algae—or from crustaceans that in turn eat algae. Animals are not able to synthesize these molecules! common: β-carotene. I like it because it’s perfectly symmetrical. It has a long chain of carbons with alternating single and double bonds. Electrons vibrating along this chain absorb blue light. So carotene has the opposite color: orange! carotene, it’s good at absorbing light. Attached to a larger protein molecule called an opsin, retinal acts like a kind of antenna, catching particles of light. Humans can’t produce retinal without help from the foods we eat. Any chemical we can use to produce retinal is called ‘vitamin A’. So vitamin A isn’t one specific chemical: it’s a group. But beta carotene counts as a form of vitamin A. • Salar de Uyuni, Wikipedia. Puzzle: What kinds of algae, and other organisms, live in the brine of the Salar de Uyuni when it rains? How do they survive when it dries out? There must be some very interesting adaptations going on. Years of experience, or maybe the mountain itself, had told the Sherpas that passing through the Ballroom on this day was not a good idea, something would happen. “Big ice will fall.” Panuru’s words echoed in my head. “How do they know?” I wondered. I was sitting in my tent fitting my crampons onto my boots when I heard it. I know the sound now. Before, when the loud rumbling began I instinctively thought of a giant semi barreling down a highway. But there are no vehicles here. 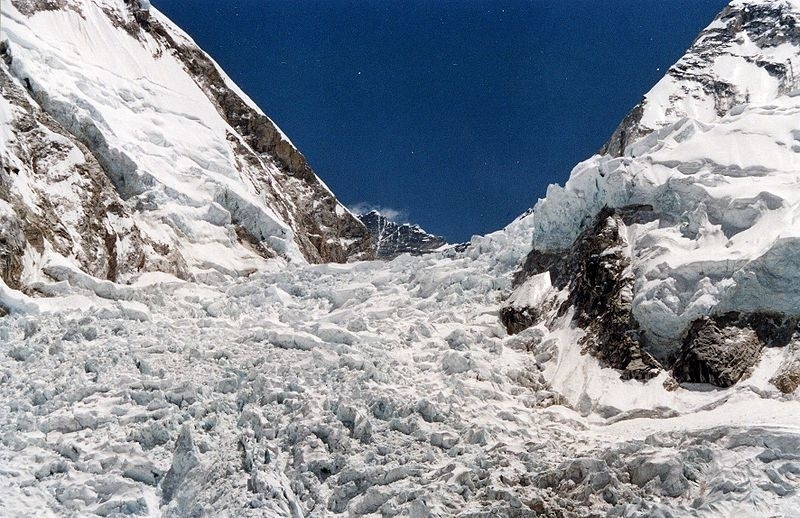 Like a gargantuan bulldozer, the Khumbu glacier plows down off the Lhotse Face between Mounts Everest and Nuptse. Dropping over a cliff just above Base Camp, this mile-wide river of ice shatters into building-size blocks and steeple-size spires called seracs. It’s riven with cracks called crevasses that can be hundreds of feet deep. 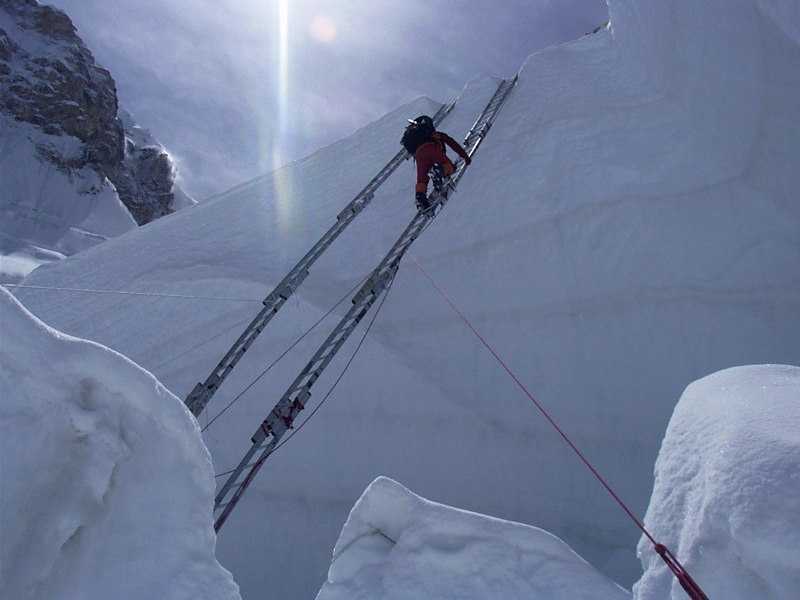 To reach our expedition’s two goals — the Southeast Ridge and the West Ridge, which both begin atop the Khumbu glacier in the Western Cwm — we must travel up through this labyrinth of raging ice. The picture above is again from National Geographic. The glacier advances about a meter each day around here. 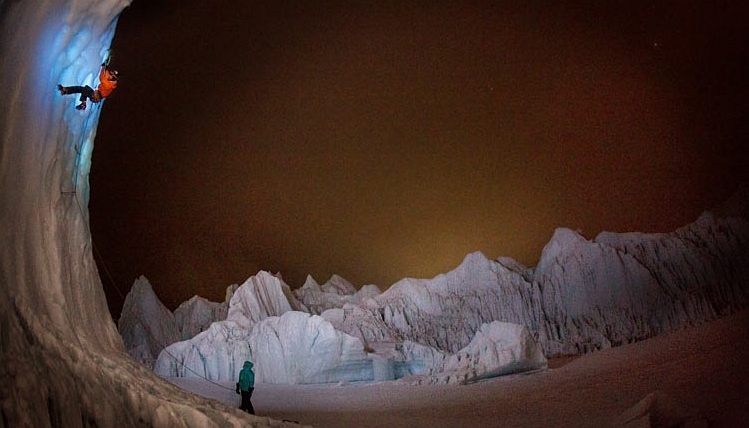 Most climbers try to cross before the sun rises, when the cold keeps things frozen. 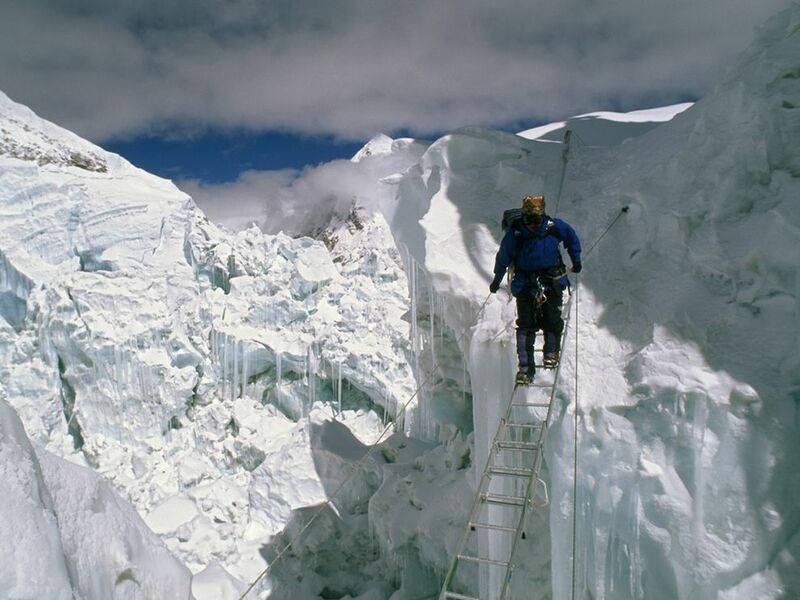 As the intense sunlight warms things, the icefall becomes more dangerous. Blocks of ice tumble down the glacier from time to time, ranging in size from cars to houses… and sometimes entire large towers of ice collapse. They say bodies of people who die in here sometimes show up at the base of the icefall years later. And this is photographer Leo Dickinson speaking about the dangers of this place. Look at the fellow poking at snow with a pick around 0:58, revealing that it would be deadly to step there! In the middle background is Lhotse. At far right you see a bit of Nuptse. And at left there’s Sāgārmatha, also known in Tibetan as Chomolungma… or in English, Mount Everest. ‘Cwm’, pronounced ‘coom’, is Welsh for a bowl shaped valley, also known as a ‘cirque’. This one is a 4-kilometer-long valley carved out by the Khumbu Glacier, which starts at the base of Lhotse. It’s the easiest way to approach Everest from the southeast. 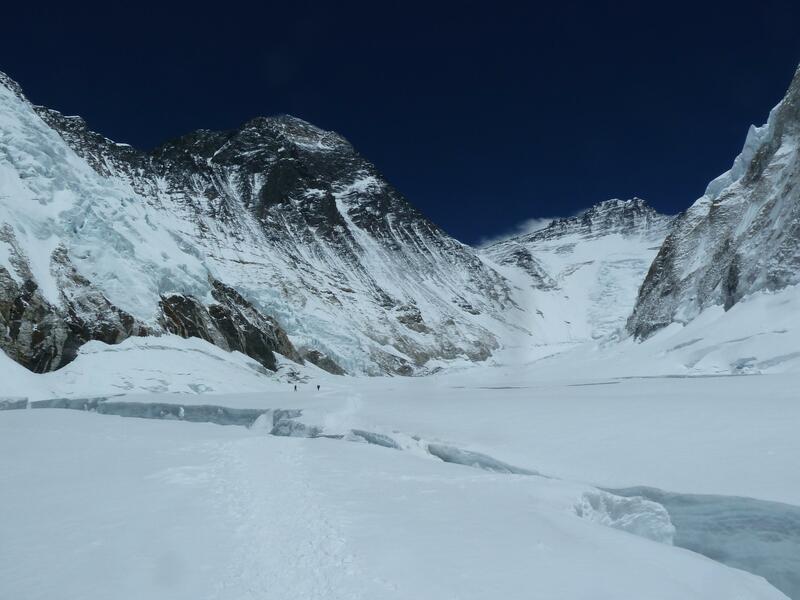 However, it’s cut by massive crevasses that bar entrance to the upper part: here you must cross to the far right, over to the base of Nuptse, and through a narrow passageway known as the Nuptse corner. It’s called the Valley of Silence because it’s often windless and deathly quiet. On days like that, the surrounding snow-covered slopes surrounding are so bright that the valley becomes a kind of solar oven, with temperatures soaring to 35 °C (95 °F) despite an elevation of 6000 to 6800 metres (19,600-22,300 feet). But when sun turns to shade, the temperature can plummet to below freezing in minutes! • Alan Arnette, Life in the Western Cwm. Want to go further? When you’ve reached Base Camp II near the top of the Western Cwm, you still have 2300 meters to climb… and now it gets steep! I’m sorry, I’m quitting here and heading back down—it’s my bedtime. Good luck! • Mount Everest summit—interactive 360 degree panorama. • Reality Maps viewer for Everest. I had become intrigued by the story of Marco Siffredi, a French snowboarder who was the first to successfully descend Everest on a snowboard via the Norton Couloir. His second attempt to descend a far more serious route, the Hornbein Couloir ended in his demise.